This book actually made me cry. I chuckled all the way through this short book, loving Billy Crystal's amusing tales growing up, and then I couldn't take it anymore. I just cried nearing the end. What a guy. And I can't help but say this, but, "I can't get in to my pants, I have five penises," is probably the funniest thing I've read in a long time. It won't make sense if you haven't read this book, but when you do, you'll know what I mean. 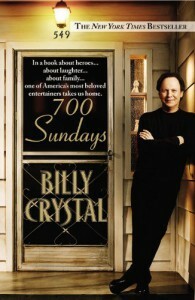 No matter what, no one can deny Billy Crystal's humor, even during a book meant to be full of sentiment. Well done, Mr. Crystal.